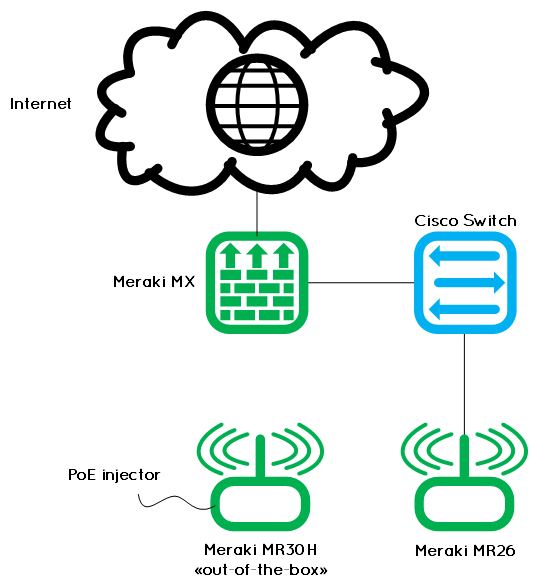 Wireless mesh networking is included and enabled by default in every Cisco Meraki AP. 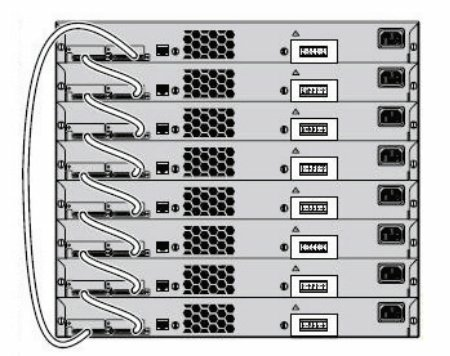 The goal is to create a self-healing network that is resilient to cable and switch failures. But, how does it works exactly? How does an AP choose between the existing neighbors? How can we monitor the status and performances of a mesh link? And as it is enable by default, is it possible to deactivate this feature? In a mesh network, access points can be in one of two states: Gateway, or Repeater. AP in gateway mode are connected to the wired network, granting it an uplink to the Internet. If a gateway loses its Internet connection, it will look for another nearby gateway and automatically failover and acting as a repeater, allowing it to continue serving clients. The AP determines if it should be a repeater or a gateway on boot, when it sends out a DHCP request on the wired interface; if it receives a DHCP reply, it assumes that it has a valid LAN connection and will become a gateway. If a gateway AP is unable to reach the LAN gateway/upstream router, the AP will fail over to repeater mode. We will see this more in details below. AP in repeater mode are not directly connected to the wired network, instead relying on wireless mesh link(s) to reach the Internet. As long as the repeater has power and an acceptable wireless connection to another repeater or gateway, it will form a mesh link. The Meraki documentation says also: “it is not possible to configure a static IP address for a repeater AP; doing so will automatically designate the device as a gateway instead of a repeater”. Both gateways and repeaters can serve wireless clients. It is also possible to have multiple gateways in a mesh network, then the Meraki Mesh Algorithm of the repeater will automatically choose the gateway to which it has the strongest connection. 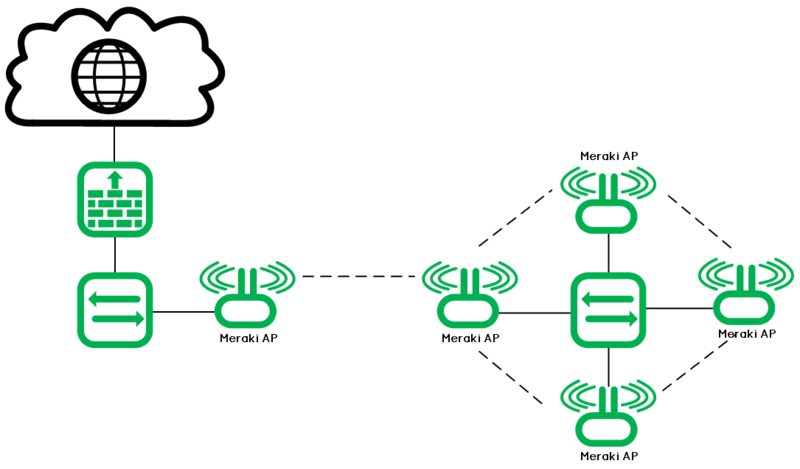 Meraki devices in a mesh network configuration communicate using a proprietary routing protocol designed by Meraki. This protocol is designed specifically for wireless mesh networking, and accounts for several unique characteristics of wireless networks (including variable link quality caused by noise or multi-path interference, as well as the performance impact of routing traffic through multiple hops). This protocol is also designed to provide ease of deployment while maintaining low channel overhead. 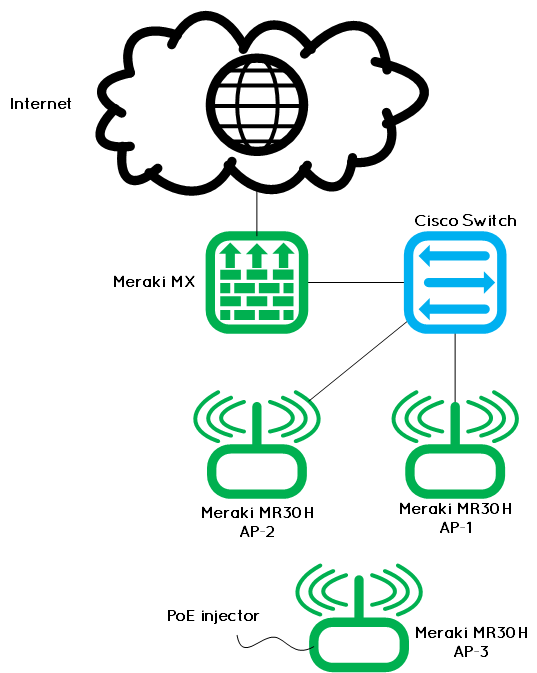 Each AP in the Meraki mesh network constantly updates its routing tables with the optimal path to network gateways. If the ideal path changes due to node failure or route metric, traffic will flow via the best-known path. 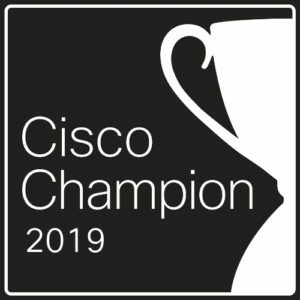 Data traffic sent between devices in a Cisco Meraki network is encrypted using the Advanced Encryption Standard (AES) algorithm. First test: one AP is connected to my wired network and working fine. The wired AP is configured with static channels: 6 for 2.4GHz network and 44 for 5GHz network. I have one open SSID configured: “Meraki-Lab-Test”. This hidden SSID is for the mesh. Then, I registered the serial number of my new AP on the Meraki Dashboard as part of my network, and I plugged the PoE injector to it. You can see the new AP on top in red, and the wired AP in orange. Impressive, mesh works out-of-the-box without connected the AP to the wired network! As you can see, the gateway AP (first) is in full green and the repeater AP (second) is a green circle. How to monitor the mesh link? Avg Mbps: 28.3 – This is the average speed of the mesh link. Avg. metric: 1179 – This is the current metric value of the Mesh algorithm. Usage = 100% – The usage of the mesh link. Here at least we can see we are using the 5 GHz channel 44 for the mesh link and the signal “in” is at 47 dB. I made another test with the same topology: as the gateway AP channels are 6 and 44, I forced the repeater channels to 11 and 36. Just to see if it accepts this silly configuration, and how we can recover from this without touching the AP or the PoE. To change the AP channels, go to Wireless > Radio Settings > Click on the AP and change the channels on the right. First, the AP accepts this configuration and obviously, the mesh link falls. I left it like this for a few minutes, with my Acrylic tool running. When I check the repeater AP status on the dashboard, it says Channel 11 and 44, despite that I forced him to use channel 36. Interesting, like this the repeater continues to have connectivity to the gateway and to the dashboard. And when I change the configuration back to auto-channel, the repeater start very quickly to advertise the public SSID again. Great! 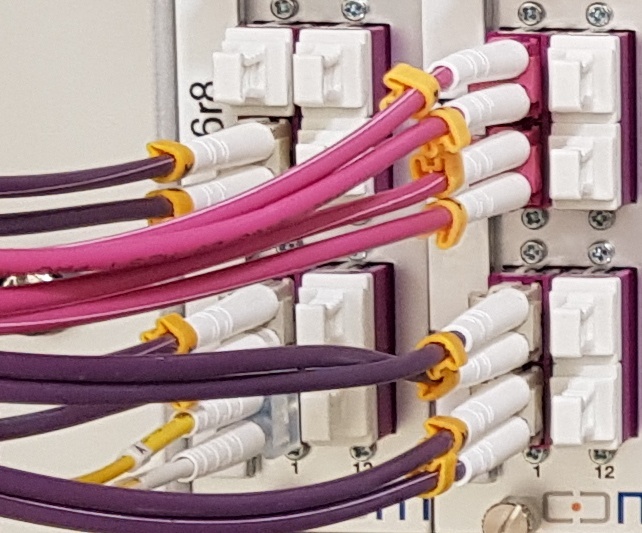 The AP-1 and AP-2 are connected to the local switch with 100 Mbps links. AP-1 is forced to use channels 1 and 36, AP-2 is forced to use channels 6 and 40. Both with 50% TX power (9 dBm) and 20 MHz channel width. AP-3 is a new “out-of-the-box” AP who was never connected to the network. I registered it into the Meraki dashboard, let the channels in auto mode, and plugged the PoE injector. The 3 access-points are in the same room, at around 1 meter (3.2 feet) to each other. After a while – this time it takes more than 10 minutes – I can see the AP-3 broadcasting my SSID. It chooses the AP-2 as gateway, on the 5 GHz channel 40. The 2.4 GHz channel of AP-3 was automatically set to 11. No surprise here, it works as the previous test. Now, the real test is to assign the same 5 GHz channel to the two gateways; like this the repeater AP can see two gateways and may switch from one to another if needed. So, I set the channel 36 to the AP 1 and 2. Very quickly, the AP-3 switched to channel 36 and continues to broadcast the public SSID. The interesting point is from the Mesh neighbors information of the RF tab page of the AP-3; we can see the APs 1 and 2 as mesh neighbors on the channel 36 (see below). A more strange point, there is also the AP-1 as neighbor on channel 11, despite the fact than AP-1 is forced and using the channel 1. As you can see, the AP-3 chooses the AP-1 as gateway, but the link quality is lower than the AP-2. But, when I clicked back to the AP summary page, I saw the gateway changed to AP-2. This is very dynamic! I tried to disconnect the ethernet cable of the AP-2, and then the AP-3 changed immediately the gateway to AP-1 and continues to work as repeater. In a future post, I will make more tests like this to get an idea of the convergence time. Can we disable the mesh feature? As I wrote before, this feature is enabled by default. If you look on the dashboard, there is no way to disable it. But, this enable or disable the mesh feature for the entire network. You cannot choose to enable or disable it only for a smaller group of AP. Or you have to move these AP to a separate network. 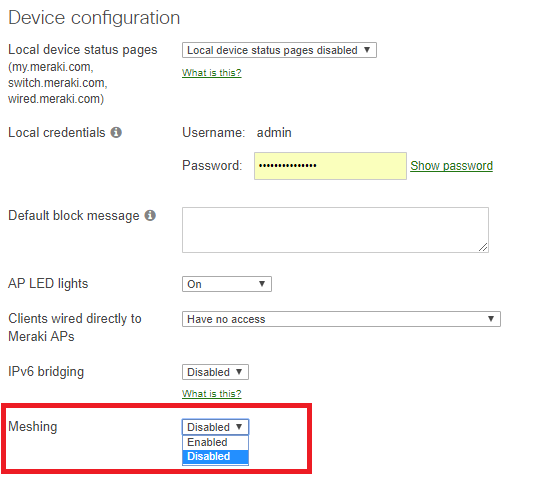 Mesh networking is enable by default on any Meraki access-points and available without any supplementary license. It works out-of-the-box, of course only if the new AP is able to “see” another wired AP (gateway) on your network. This is dynamic and automatically chooses the best mesh link to the wired network. 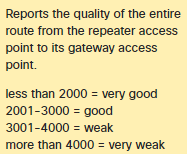 As far as I know, it is not possible to influence which gateway a repeater will connect to, except by setting the frequencies manually on the APs. For instance, it is not possible to change a mesh link metric, like we do for a routing protocol, to prefer one path on another. Note: I was using firmware version MR 25.9 for all the tests.